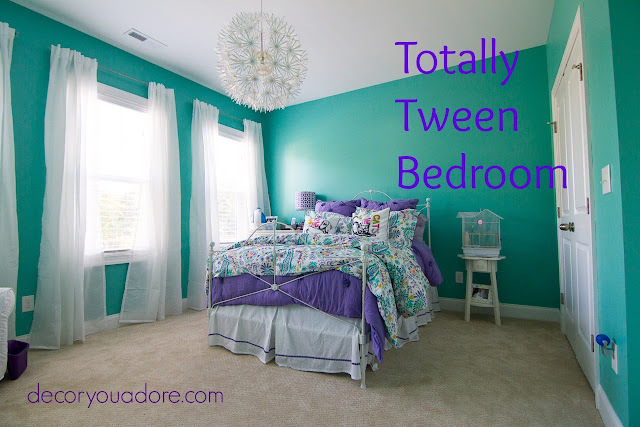 Decor You Adore: Tween Room fit for a queen! Hello adorables! Welcome to the first glimpse of what I've been up to for the last 5 weeks! 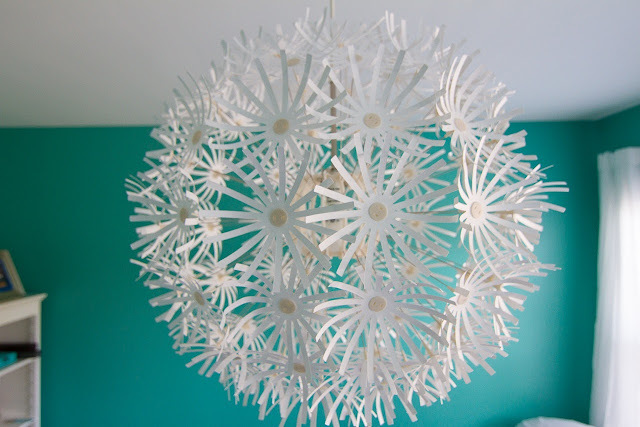 Since we were slightly homeless for the summer, I was anxious to let out my inner decor diva. 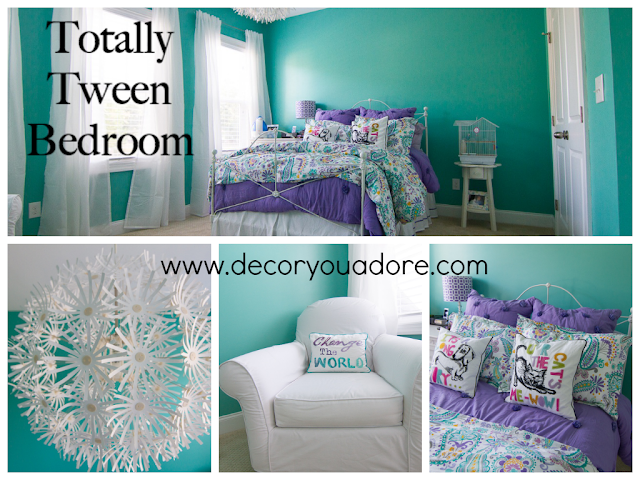 The project I was/am most excited about is my 9-year-old daughter's bedroom. Literally, 2 hours after we closed, the room was transformed from builder beige to Sherwin Williams Cooled Blue! 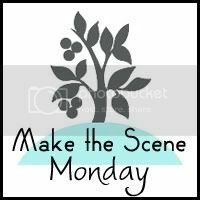 Lots of times it is difficult to know exactly how you want to lay out a room BEFORE you actually move in the space. Not this one. I'm a die-hard Pottery Barn bedding fan and have been addicted to their children's furniture since this lil' girl was the size of a peanut! 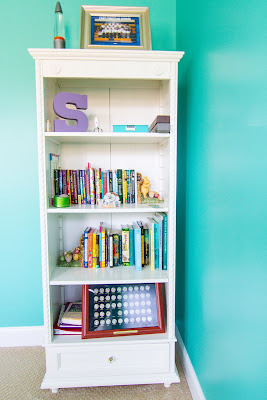 I knew exactly what I wanted and how I could use her existing furniture and layer in some new stuff for a totally tween room. Before we moved, I was busy ordering bedding and sending Jacki off to Ikea for this awesome light fixture that we used in Ruby's playroom. It was too adorable not to imitate. I am not too proud to admit that I essentially bribed my daughter to keep her wrought iron bed with the promise of new bedding. And, since I adore layered bedding, I knew I wanted a quilt and a duvet with complementary patterns for added interest and texture. Plus, my daughter loves to snuggle up in her cozy covers. Who wouldn't, right? 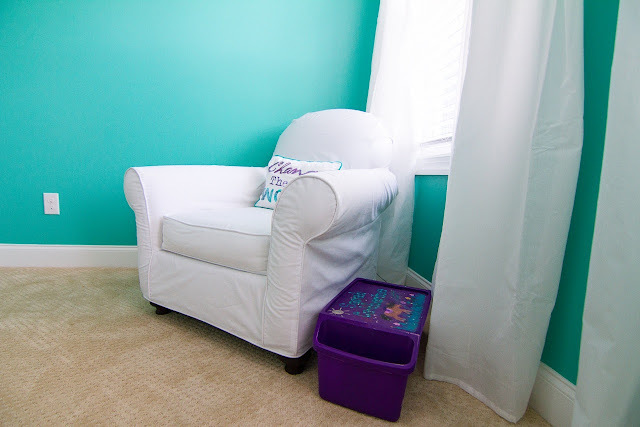 I started with the Pottery Barn Teen Crinkle Puff Quilt and two euro shams. To be honest, I think my version looks better than theirs! Since my girl is an animal lover, I topped off the fluff-tastic set with two of PBT's pillows whose sales benefit the ASPCA. 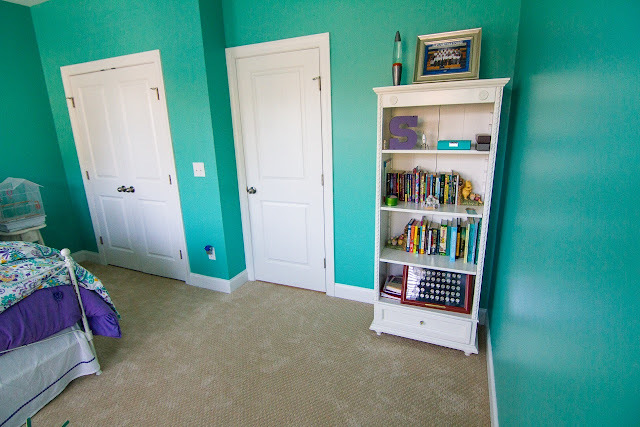 Her bookcase fit nicely in the space behind the door. My handy hubby installed a door stopper that won't let the door open fully so we won't have a permanent dent in the side of the bookcase. Her bookcase is mainly about practicality since she's an avid reader. But I couldn't resist this adorable "S" representing her first name on a turbo shop through Homegoods. My 5-year old was with me and was dying to have an initial of his own. Since we couldn't find a B (the first letter of his name), he said he was willing to settle for an E (the 2nd letter of his name). Bless his little learning-to-spell heart! Near the windows we added a cozy chair for reading. It is actually the Pottery Barn Kids dream rocker from about 10 years ago. It has gotten several makeovers by way of custom slipcovers. I was going to show you a few pics of the (almost) nine lives of the PBK dream rocker but it turned into a long, sordid tale that I'll save for another day. Long story short, we took the rockers off and added turned legs since we aren't rocking any more babies around here. I just love it with its new slipcover! 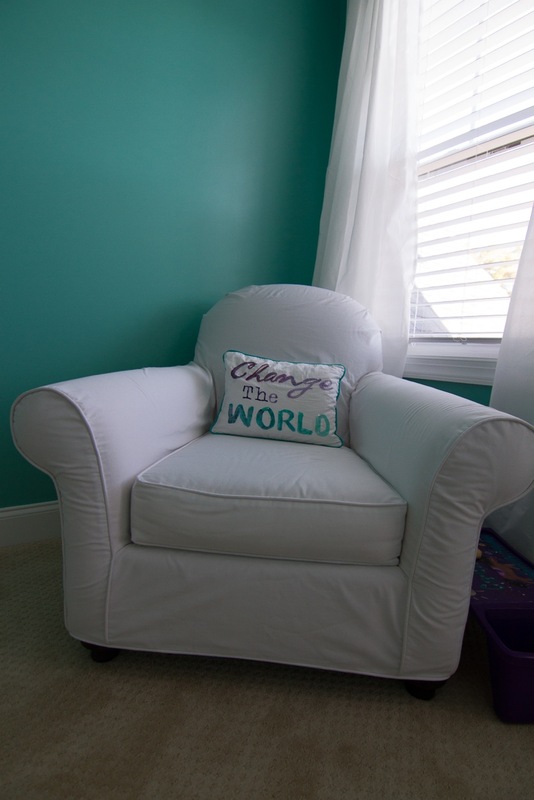 Change the World pillow from PB Teen. Last, but not least...we scored a DEAL on curtains. These bad boys were 2 for $10. No, that is not a typo. Three windows got dreamy little sheer-ish curtains from Ikea for only $30. And, my BFF Jacki hooked me up with $7 rods at Ross! Three windows for under $55, can I get an AMEN? We still need some art work on the walls and her desk will go next to the dream rocker opposite the bed but I just couldn't wait to share with our adorable followers. If you want us to whip up a room for your tween, just give us a call! Love the room and the girl...can't even bring myself to refer to her as the T---- word. She shouldn't be that old.